If you get a optical warning like for example in EDFE "Class C above 1.500 ft" the voice alert tell me in 700 ft "...airspace 800 ft above...". This is correct but confusing. Thank you for better and better SD. Thank you for the feedback. 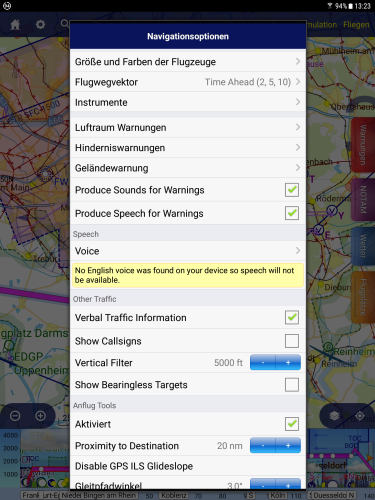 Can you confirm you do not have any English Siri voices installed in your iPad's settings? Ok. We did some work for yesterday's beta where speech should not be enabled if there's no English voice available or configured. Have you tried upgrading to that beta to see if there's any change? Tested the new android beta yesterday. Seems to work perfectly. Hi Tim, after installing the new Beta from 11.02.19 I don't get any voice alerts. Not in english, not in german and not in english/german. Samsung Tab S2. Hi Peter, the yellow field is not clickable. Do you mean this list below? thank you, now the voice alert works fine in english.